The taxable container generally refers to a brokerage account that is not specifically earmarked for retirement, though funds in this container can be used for any purpose at any time. These accounts are considered taxable because income they generate in a given calendar year are all taxable events for that year. Income includes interest income, dividend income from either stocks, bonds or stock and bond funds, capital gain distributions from funds, and capital gains for any holding sold at a gain in that year. If sold at a loss, a capital loss is realized. Note that capital losses can have useful tax benefits and a strategy of harvesting capital losses makes sense for most investors. A strategy of capital loss harvesting combined with tax-efficient holdings can help mitigate the resulting tax bill. The tax-deferred container includes 401(k)s, 403(b)s, 457s, Traditional IRAs and a variety of other plans. These accounts are funded with pre-tax money which means that amounts added to these accounts are removed from the investor’s gross income for tax purposes for the calendar year for which the accounts are funded. These accounts provide short-term, immediate tax benefits which can be most welcome in high income years when every tax break should be considered. The downside? Tax-deferred assets will be taxed later, upon withdrawal. When you consider these assets in your long-term planning, you must mentally lop off a portion of this container and visualize it going to the IRS and your state’s tax board. 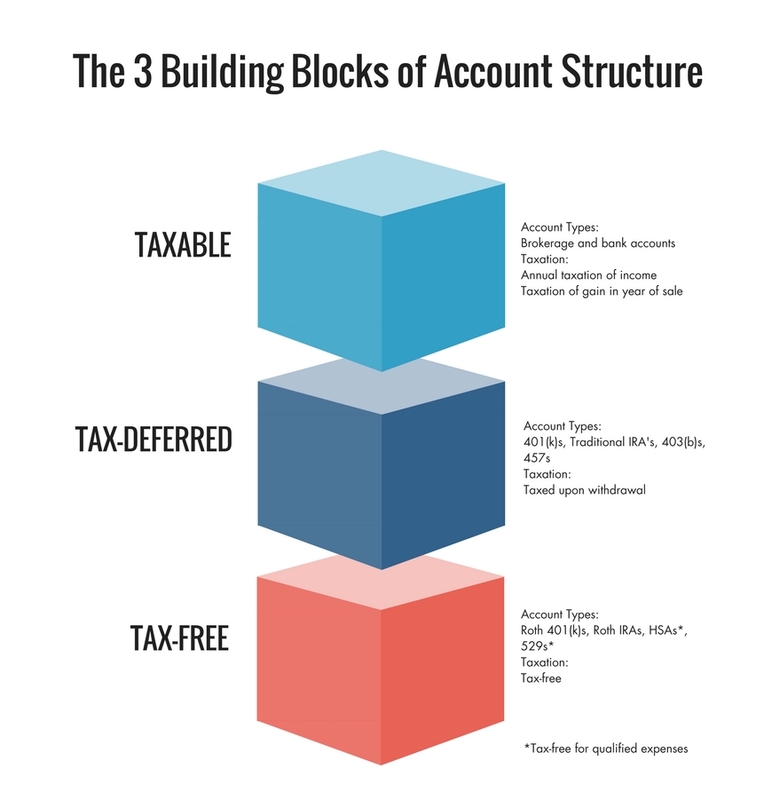 Completing the trifecta of account structures are tax-free accounts. They include Roth IRAs, Roth 401(k)s, Health Savings Accounts (HSAs), and 529 plans for higher education expenses. Generally funded with after-tax money, assets in these accounts grow tax free and withdrawals can be tax free, though in the case of HSAs and 529s the withdrawals must be for qualified health or higher education expenses. Health Savings Accounts also have a double tax benefit: you can use pre-tax money to fund the accounts, and a few lucky states have 529 plans with a similar “double dip” in the form of credits or deductions for contributions made by residents of those states. To learn more about Roths, review “To Roth or Not to Roth” by my BlueSky colleague, John Gjertsen. While it is impossible to predict the perfect ratio of taxable, tax-deferred, and tax-free assets to try to attain, entering your retirement or financial independence years with assets in each container sets you up to fine tune your tax liability, potentially for decades. Here’s how it works. Let’s say you stop working at age 66 and you have built up a nest egg across all three containers. Let’s also assume you opted to defer your Social Security start date to age 70. How will you cover expenses from ages 66-70? You can draw from taxable, tax-deferred or tax-free sources, but which container or combination should you use? Some simple tax projections can help with this decision making. If your combined income sources will keep you in a low tax bracket, it may make sense to use some tax-deferred assets to cover expenses. While this will add to your tax liability in the short term, it may do so at a low marginal rate. This is particularly attractive if your projected marginal rate will be higher after the age of 70 ½ when required minimum distributions from tax-deferred assets begin and Social Security income is underway. By taking some tax-deferred withdrawals or making Roth conversions in your pre-RMD years, you are shifting your tax burden to lower tax years while reducing the size of accounts that are subject to the RMDs in your post 70 ½ years. After withdrawing the target amount of tax-deferred assets, additional expenses can be covered by assets in the taxable container, which may result in typically lower capital gains taxes if holdings are sold at a gain, or completely tax free if taken from the tax-free container such as Roths and HSAs. 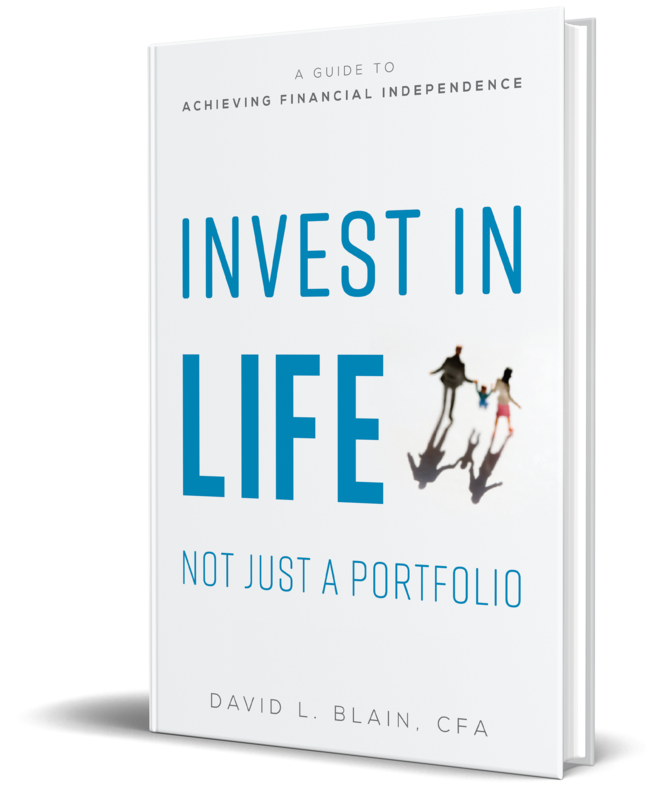 We encourage clients who are accumulating towards their financial independence goals to consider the containers available to them and develop an investing plan that balances short-term tax benefits with a long-term a view towards lifetime tax liability. 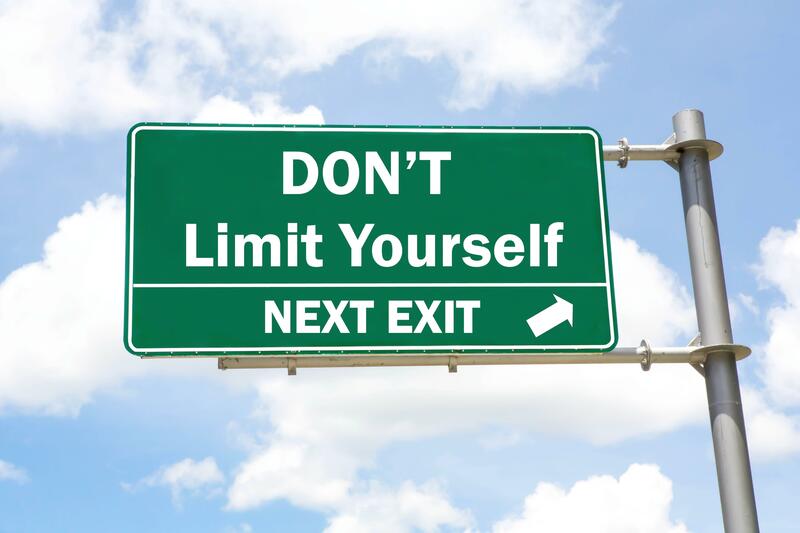 Sometimes a deeper look at your employer provided plan yields opportunities for additional tax-deferred or tax-free accounts, or nondeductible contributions to an IRA could be made and then later converted to a Roth. For clients who are in a transition to retirement, they may be in a sweet spot where low taxable income allows them to use tax-deferred assets to fill a lower marginal bracket with either distributions from a tax-deferred account or Roth conversions, which allow you to shift tax-deferred assets to the tax-free container. For clients who are financially independent and drawing from their portfolio to cover expenses, it may feel too late to fund all three containers but if you have at least two funded, you can take advantage of the same principles. Roth conversion might also still be an option. At any stage, you should ask yourself if you are using the best combination of opportunities for your specific situation. It can help to get guidance from your advisor or tax professional when making these decisions.